Higgins has pointed out that his predecessor Mary McAleese returned the balance when she finished her two terms. INCUMBENT PRESIDENT MICHAEL D Higgins has said he will return the balance in the Áras account at the end of his presidency. 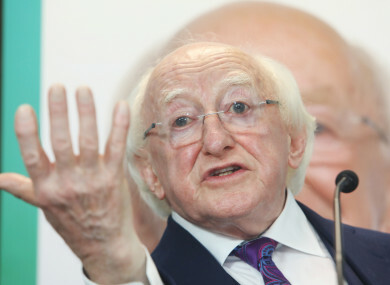 A spokesperson for Higgins’ campaign told TheJournal.ie that the President, speaking in Cork today, referred to the fact that former President McAleese had returned the balance in the account when she left the presidency after two terms. At the launch of his campaign last week, Higgins said he had no issues with transparency with regard to his expenses. He pointed out that the €317,000 fund had been in place since 1938 and said it was used for entertainment such as tea parties, events like Bloomsday and those commemorating the victims of the Magdalene Laundries. At the time he had also referenced the fact that Mary McAleese had returned about €450,000 at the end of her two terms as President. It is a fund I never see, but I emphasise, it if voted for by the Oireachtas, it is within its gift to rescind it, but that would put a severe restriction on (Presidential) hospitality. He was also asked last week about being accommodated in expensive hotels during foreign trips. “I couldn’t care less if I stay in a tent,” he told reporters. Email “Michael D Higgins will return €200k balance in Áras account at end of term ”. Feedback on “Michael D Higgins will return €200k balance in Áras account at end of term ”.